Yesterday evening I tilled the 2145 cover crop and amendments into the soil and re-positioned the wind fences around the plant. That plant is starting to kick into gear now. I noticed a few female in the vine tip, so 10-14 days from now we should be pollinating. That should be about perfect timing. 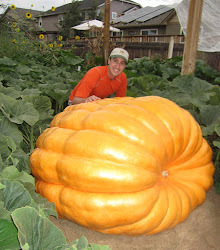 It gives an ideal number of growing days to the weigh-off and the plant should be at an sufficent enough size by that point to be able to start pushing to the pumpkin. This morning I sprayed a light mixture of 3-12-12, Omina (14-0-0) and fulvic acid on the soil. I haven't been quite as diligent as I would have liked on my fertilizer program. I've followed the program, but haven't been quite doing the daily spoon feeding. Tomorrow or Thursday I plan on having the daan micro sprinklers setup in the 2145 patch with the fertigation setup running. That will automate the fertilizing which will be nice.